On a quiet street in a San Luis Obispo neighborhood, a nonprofit recovery group is poised to take a leap of faith to fill a gaping void. With no obvious source of funding so far, Project Amend is preparing to become an affordable, state-licensed residential rehab facility for people with drug and alcohol addictions. 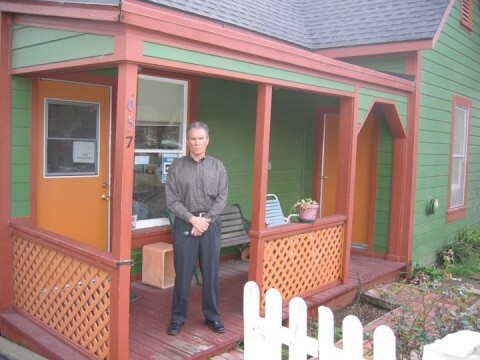 OPENING THE DOOR TO DETOX : Project Amend in San Luis Obispo is ready to become a state-licensed residential treatment center to help people addicted to meth, alcohol, prescription painkillers, or other drugs, with Michael Axelrod (pictured) as a counselor. # bed facility, which also concentrates on counseling and 12-step recovery. "I'm incredibly excited. The county needs this so desperately," said Jack Witter, president of Project Amend's board of directors. The group has operated a sober men's living facility on Sweeney Lane for five years, but their plans to receive a state license will help them add medically supervised detox, counseling, and rehabilitation for addicts under one roof. A fire sprinkler system is currently being installed to help the facility meet state requirements. The next steps: applying for a state license and finding the $22,000 needed to pay for the sprinklers. Project Amend's directors said they have "strong faith" that the needed funding will be forthcoming, but admitted that the group is prepared to go into debt if necessary. They expect to submit their license application to the California Department of Alcohol and Drug Programs before the end of April, followed by a 120-day state review period to make sure all requirements for licensing are met. "I think it's wonderful," Dr. Star Graber, manager of SLO County Drug and Alcohol Services, said in reference to the plans. "The methamphetamine epidemic has heightened awareness of the need for detoxification in this county," she said. Currently, Drug and Alcohol Services sends its clients to Santa Maria for detox, Graber said. For years, SLO County had a county-run residential detox facility behind General Hospital in SLO, but due to funding cuts it closed in 1982. In-home, outpatient detox became the county's focus for the next decade, with General Hospital offering medical supervision but since the hospital closed in 2003, SLO County has had no residential facility for treating addiction, she said. "It's reprehensible for a county of this sophistication not to have a licensed in-patient treatment center," said Michael Axelrod, Project Amend's drug and alcohol counselor. Axelrod is a strong supporter of group psychotherapy, as well as one-on-one counseling and education. "The group thing is awesome. It's a powerful, powerful process. The beauty of that treatment, you can be in the Betty Ford center, or you can be in a garage. It's just a circle of people taking an honest look at themselves, getting in touch with who they are and what's keeping them from loving that person," he said. "The group facilitator is almost like a conductor. You can just feel the spirituality in the room," added Axelrod, a recovering cocaine and whiskey addict himself. Project Amend requires its clients to attend 12-step meetings through Alcoholics Anonymous or Narcotics Anonymous, as well as undergo regular urine testing for sobriety. The house was first set up as a recovery center by Patrick McKnight, who "had an epiphany" while sitting at a nearby bus stop in the rain, Axelrod explained. McKnight became a certified addiction specialist dedicated to helping former prisoners live clean, productive lives. McKnight, who recently retired from the project, put together a dedicated board of directors, which now includes among others Jack Witter, president psychiatrist Dan Gordon, vice president Jayne Morton, secretary and Jim Gall, fundraiser and past president. As birds sing in the backyard trees at Project Amend's facility, recovering men are putting together their new lives. "Here's a poster-boy for recovery. He was so scruffy and snarling when he came in, and now he could pass for a Boy Scout leader," Axelrod joked, introducing a smiling client to a visitor. Gordon, the group's vice president, will be the medical director of the facility once it receives a state license. "Detox is just the very first part of treatment," Gordon explained. "I think we really need this. Methamphet-amines are an enormous problem in our county. But there are also a lot of people using alcohol, marijuana, and doctor-prescribed opiates. We see ourselves as helping people with all chemical dependencies," Gordon said. "This won't meet all the county's need, but it will go a long way," county Drug and Alcohol Services' Star concluded. Project Amend (782-9600) is seeking donations of funds, twin beds and bedding, and labor, including painting. New recovery clients are also welcome. The admittance fee is $425, with some free placements also available. A commitment to treatment and involvement in a 12-step program is required.